When it comes to injuries and illness, children are not “little adults”. Treatment of injured and ill children requires specific skills and types of emergency care equipment and supplies for proper assessment and emergency care. The Emergency Medical Services for Children (EMSC) is a national initiative administered by the U.S. Department of Health and Human Services’ Health Resources and Services Administration (HRSA) and the Maternal and Child Health Bureau (MCHB). Its focus is to reduce child and youth disability and death due to severe illness and injury by ensuring access to high quality emergency medical care for all children everywhere in the United States. It is the only federal grant program that specifically focuses on addressing the needs of children in prehospital and hospital emergency medical systems, and has provided grant funding to all 50 states, the District of Columbia, and five U.S. territories since its establishment in 1985. The program develops partnerships across the continuum of emergency care and provides special programs and training opportunities, all with the aim of: ensuring that state-of-the-art emergency medical care for ill or injured children and adolescents is available when needed; ensuring that pediatric services are well integrated into the existing state emergency medical services (EMS) system and backed by optimal resources; and ensuring that the entire spectrum of emergency services, including primary prevention of illness and injury, acute care, and rehabilitation, is provided to children and adolescents at the same level as adults. 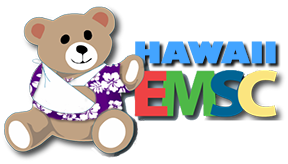 The EMSC State Partnership Program is a statewide collaborative project under EMSC that provides funds to states to assist in improving the pediatric component of their EMS system. It’s mission is to assure effective pediatric emergency care according to best practice standards statewide through expanding and improving the state’s capacity. State governments and accredited schools of medicine in states are eligible for the grants, which can award up to $130,000 per year, for a 4-year grant period (current grant period April 2018–April 2022).